When you're traveling with someone who relies on a wheelchair, it's important that the fun stuff as well as necessities are easily accessible without a lot of fuss.When you're traveling with someone who relies on a wheelchair, it's important that the fun stuff as well as necessities are easily accessible without a lot of fuss. Most hotels and resorts offer handicap accessible entrances, rooms, and elevators, but it may be a surprise (certainly, not to those who run into this problem often), that many of them don’t offer the same services for pools. Are you planning a family beach getaway? If you, a family member, or loved one is having trouble finding a hotel or resort that offers pool access to the physically challenged, look no longer. We have come up with a list of five, wheelchair friendly hotels on the East coast of Florida that will let everybody experience cool pools and hot sun. In Daytona Beach, Perry’s Ocean Edge Resort, which sits directly on the beach, is the perfect getaway. With two outdoor pools and one indoor pool, the resort has a pool lift, which allows easy access for those in wheelchairs. It also has other facilities for the physically challenged, and 2010 rates start at just $100/N. The resort also has an intensive kid’s activity program, so there’s something for everyone in the family. Two resorts in Palm Beach also offer similar amenities. At The Breakers, a super deluxe place, the rates are a little more expensive ($$$), but five oceanfront pools and four whirlpool spas might explain why. Unlike Perry’s, this resort has no pool lift but does have an active pool where, instead of a pool ledge, the pool floor acts more like a beach, getting gradually deeper. Another family-friendly resort, kids under 16 stay free in the same room as their parents and can enjoy a kid’s camp. Also in Palm Beach, the Ritz Carlton boasts an exclusive beach, and two outdoor pools with a pool lift. The resort also features the AquaNuts Ritz Kids facility and the Coast Teens Lounge. This is another beautiful and very deluxe property, with summer rates at a great discount, and only $$ per night and up. Heading further South, Miami’s Fountainebleau may be the most family-friendly of all these beach getaways. The resort has a pool lift, as well as a zero entry wading pool for the physically challenged. At $$ per night, for a standard room, the resort has a special area for kids, outfitted with comfortable cabanas and lounge chairs that allows parents to relax while overseeing their children at play. The resort’s youngest guests can enjoy an interactive play area with a beach-style entry, waterslide, spray canopy, and water canons. It also features multiple small dipping pools and an interactive children’s waterscape play area. 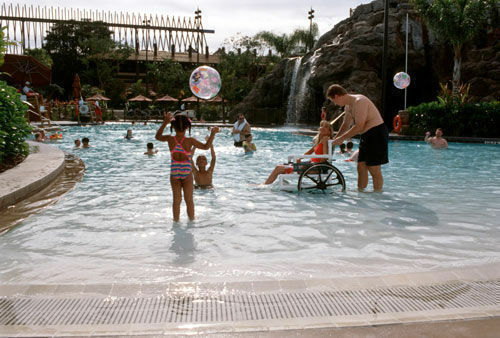 Loews Resort, also located in Miami, offers a variety of unique programs and services for grandparents, kids and pets. The resort has entry rails and a water chair for easy access to their oceanfront swimming pool and Jacuzzi. Rates start at $$ per night in summer, and include a lending libraries of games, special children’s menus with healthy options, local area tours, Fisher-Price welcome gifts, Kidbanas shelters by the pool, and supervised recreational programs. Prev Article Prev Article Free Orlando!